This project is a work in progress. 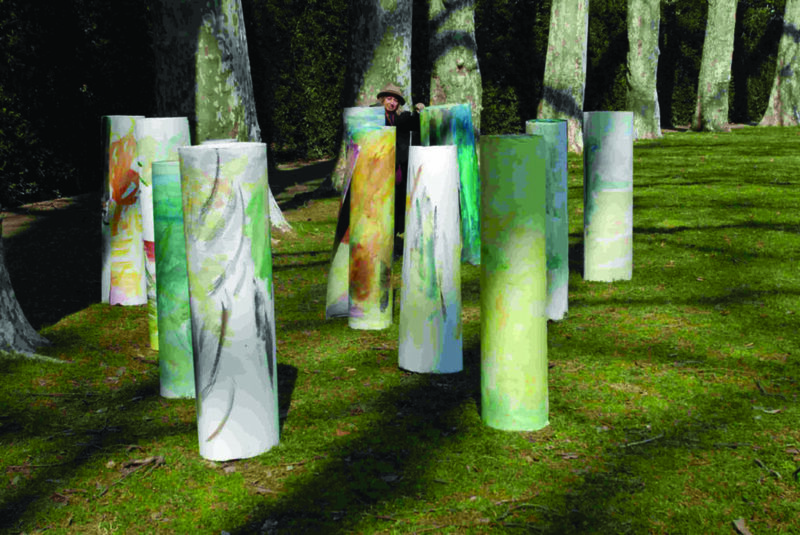 It began in 2001, originally inspired by Boboli Gardens in Florence, with its intriguing paths and secret spaces, as an exploration of the garden as a place of discovery and transformation, but has grown as each new body of work or presentation generates new ideas. 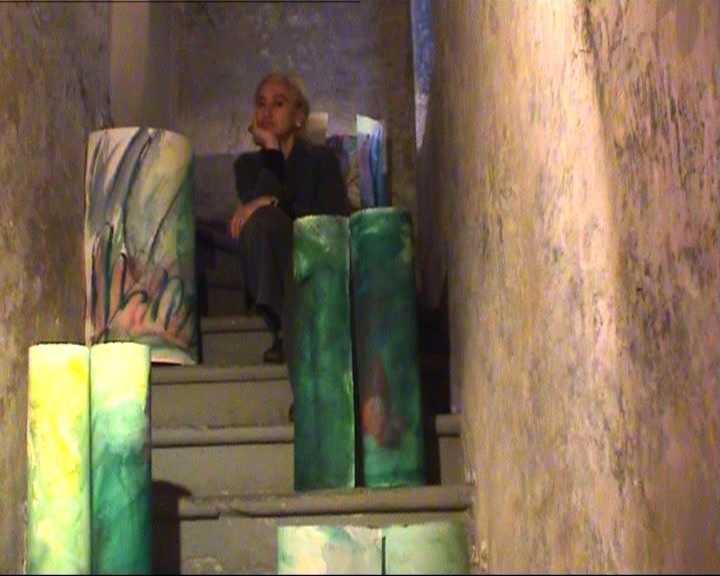 It includes video works, texts, sculptural books, three-dimensional works (the columns), photos, mixed media work on transparent papier non tissé, performances and installations. A hoe a trowel a hosepipe. A place in the future. Javier Quintanilla invited me to come to Barcelona to exhibit my current work in September of this year, when the world seemed to be falling apart. 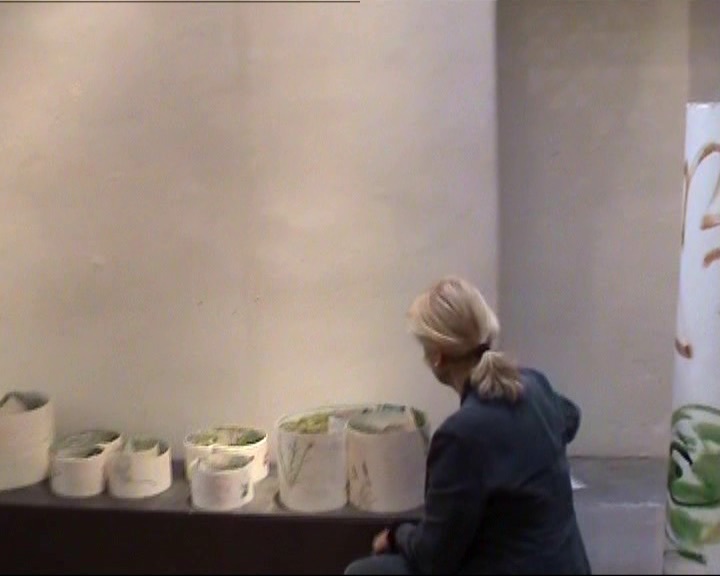 At the time, I was working in the studio and outdoors on ideas relating to “Secret Gardens”, ideas of enclosed circular spaces, of nature as a source of solace and inspiration. 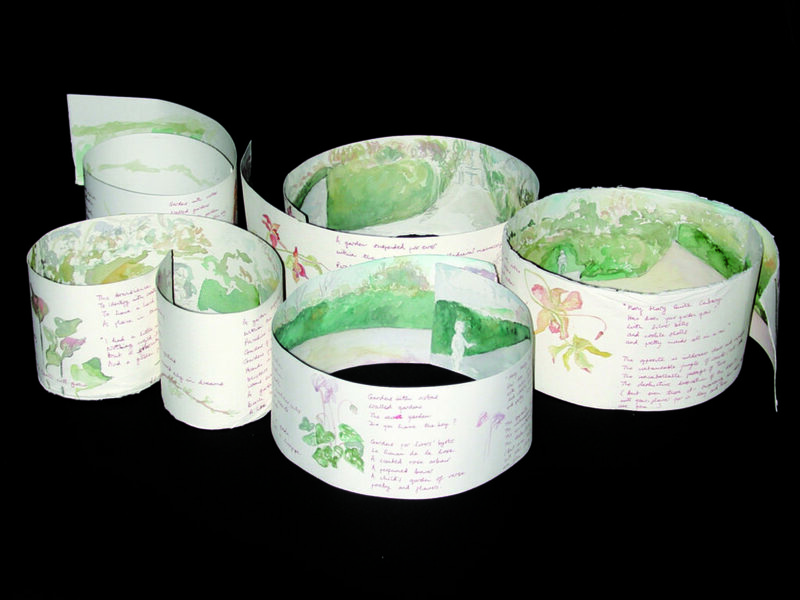 Every day I worked on paintings of flowers for my circular books: examining the exquisite variations and subtleties within a single plant was like a form of meditation. But then I would switch on the TV and see that another aeroplane had crashed, a newspaper headline announced that biological warfare was imminent, bank clerks in Florence were now wearing protective white gloves, a close friend was critically ill, there were health problems in my family. The destructive dessication of the desert”. The physical act of travelling with my work to show it in another country (Spain), involving my lifelong friend Kallitsa who will be coming from yet another country (Greece)to perform, this is an act of faith – a reassertion of a belief in fundamental human values of love, friendship, creativity, continuity and renewal. Despite the apocalyptic world events, the rhetoric of world “leaders”, the climate of fear, one of the e-mails I received from a friend in London was accompanied by a petition from members of the University of Chicago – an open letter addressed to George Bush and other heads of government pressing for dialogue, urging them to search for other solutions to war. the letter gathered over 700,000 signatures – a small voice, maybe, among the many louder voices in the U.S. clamouring for war and revenge, but out of such small seeds large plants grow.